The Gold Medal Gala is Oklahoma’s premier gala celebrating people with intellectual disabilities and the Special Olympics movement in Oklahoma. Guests enjoy exciting live and silent auctions, plated dinner and dessert, cocktails, and a short program featuring the Barry Switzer Award of Excellence award winner along with Special Olympics athlete and their parent. The event offers businesses and individuals an opportunity for networking with notable members of the business community; entertaining employees, client guests, and friends; and demonstrating a commitment to people with intellectual disabilities and the Special Olympics movement. Special Olympics Oklahoma is so excited to announce that Oklahoma State University will be the recipient of the 2019 Barry Switzer Award of Excellence. The award will be presented from Coach Switzer during the Gala. Oklahoma State University has been the home of our Summer Games since 1984 where we now host the largest Special Olympics Summer Games in North America. 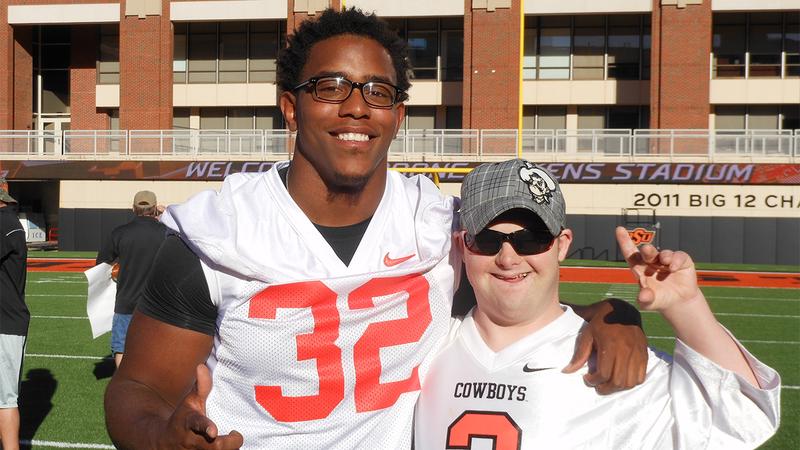 Special Olympics Oklahoma is proud to be the Big 12 Conference charity of choice and Oklahoma State University is a huge advocate with their support of Special Olympics Oklahoma. Not only do they host our Summer Games annually, they also host our state Equestrian competition and our coaches training clinic. Congratulations Oklahoma State University, for being honored as the 2019 Barry Switzer Award of Excellence recipient. For more information on sponsoring a table or reserving tickets, Gold Medal Gala Packet.